We all know that advocacy plays an essential role in a democratic society. Along with voting, advocacy provides a way for citizens to influence legislation and policies. But just how do you go about it? Our speakers shared when, where and how to make your voice heard and how to do it effectively. View program on YouTube video. Motivating people to vote involves proven strategies as well as new approaches. We learned how we an get more Johnson County residents to the polls for each and every election. Watch a video of the meeting. 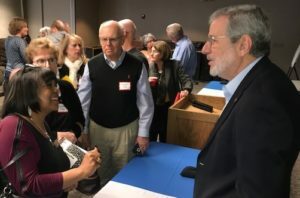 National political organizations representing issues from both the political right and left are calling for a Constitutional Convention to recommend changes. We learned about the dangers a convention poses and why the League of Women Voters thinks opening the Constitution could harm America’s basic principles of government and citizens’ individual rights. Our presenters described the potential risks and ways to advocate for the rejection of a proposed Constitutional Convention. See their presentation here. Read background info about a Constitutional Convention. Our annual breakfast and meeting celebrated the power of everyday activism. Our featured speaker, Elizabeth Arnold, shared how small, individual efforts can create big change. that informs residents about legislation affecting public schools and documents how elected officials are voting. Environmental scientist David Dods shared simple ways we each can make a difference in our own backyards. He also discussed land use planning, urban sprawl, climate change and other important environmental issues so we can make more informed decisions at the polls. Our panelists shared details about the challenges of the journey to citizenship. It is a long process with many requirements and associated costs. Angela Ferguson, immigration attorney. described the different categories and the related laws and paths to citizenship. View her 24-minute presentation..
Hilary Cohen Singer, Jewish Vocational Services, reviewed the impact of the number of applicants and the actual number of those that have gained citizenship. She also discussed the resettlement process and programs. View her 13-minute presentation. Tracy Fuller Forbush, Catholic Charities citizenship program manager, described their educational program to assist immigrants in preparing for citizenship. View her 31-minute presentation. Allan Katz, founder of American Public Square will share tips and techniques of holding a civil conversation. American Public Square brings together non-like-minded people for fact-based, civil conversations about national, regional, and local issues. It is a nonprofit, nonpartisan organization that seeks to change the tone and quality of public discourse. It organizes programs about community, health, education, civics, and faith. At its dinners and meetings, panelists with opposing views engage with each other and the audience in civil discussion. If the tone of the conversation veers from civility, audience members ring the “civility bell,” which reminds everyone to take a deep breath and work together toward real, effective solutions to the issues at hand. League members engaged in planning for 2018 with a host of new ideas.